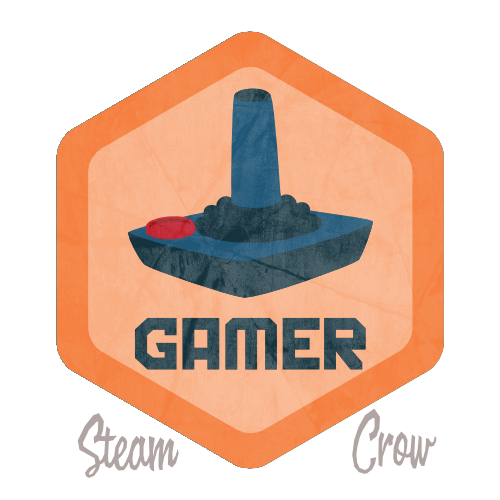 We have a lot of gamers in the Monster Rangers, from RPGs to card games, ARGs to video games, wear this badge to show off your gaming chops. There is but 1 level of the Gamer Badge. I had an Atari 2600, and used to play it a lot with my pals Kambiz and Charlie. We’d flip Asteroids over and over, until we were so bored out of our skills, we’d pass out. The Gamer Spirit Badge is worth 25 Karma points, the same as most Spirit Badges. That old joystick would make lots of crinkle noises when you’d move it, which was always a little troubling. However, it’s an iconic symbol of my childhood, so there it is! This is a common badge, though you’re welcome to get one here. Play 1 classic game from each decade: 70’s, 80’s, 90s’s, 00’s, 10’s in one day. Conquer/Win 1 game in the next month. Go outside and sit in the woods/wilds for a while, and don’t play any games at all. There’s no need to register this Challenge with us; simply log it into your Rangers Handbook.